Despite its name, the Roman Theater (Nabataean Theater) was actually built by the Nabataeans over 2,000 years ago. This massive and impressive theater in the ancient city of Petra was carved out of rock into the side of a mountain, destroying existing caves and tombs in the process, though you can still see some tombs above the theater. The auditorium and the orchestra area of the Roman Theater, built at the time of Aretas IV (9 BC–AD 40), were cut out of rock, while the stage building was built separately. The theater follows the plan typical of Greco-Roman theaters, where the seating extends to the orchestra level. Originally designed to seat 4,000, it was expanded under Roman rule after AD 106 to seat up to 8,500. The theater, damaged by an earthquake in AD 363, remains one of the most popular sites in Petra. 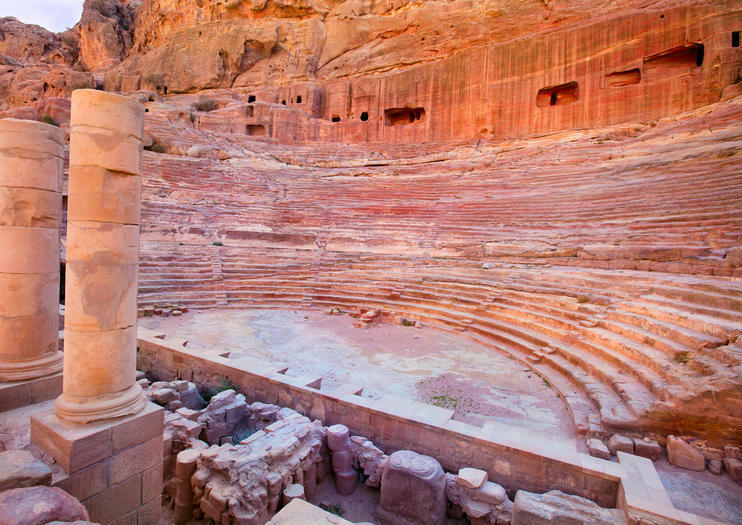 Visit the Roman Theater and other Petra highlights, such as the Treasury and the Monastery, on a guided tour. Those with more time can take a multi-day tour of top Jordan attractions, including Petra, Jerash, and the Dead Sea. Tours also originate from either Eilat or Tel Aviv in Israel, and include single-day and multi-day options. Wear comfortable, sturdy shoes to explore Petra, as there will be a lot of walking. Bring sun protection and lots of water, especially in the summer. Cafés and stalls sell souvenirs near the Roman Theater. The Roman Theater is located inside the ancient city of Petra, three hours by car from Amman and two hours from the port town of Aqaba. From Petra’s entrance at the end of the Siq, it’s about 1.5 miles (2.5 kilometers) to the theater, past the Treasury and the Street of Facades. Hiking around Petra, a huge site, can be taxing; some opt to hire donkeys or camels to navigate the complex. The best times to visit Petra are in the early morning—independent travelers can aim to be at the gate at 6am—or late afternoon, to beat the crowds and the heat. Petra’s sights are known for the way the sunlight plays on them throughout the day, beginning at sunrise, but not for lovely sunsets. Photographers are better off aiming for an early arrival. The Street of Facades and the High Place of Sacrifice are both close to the Roman Theater and worth a visit. You’ll pass by the Street of Facades, featuring tombs with beautiful carvings, on your way to the Roman Theater. The High Place of Sacrifice requires a decent hike up, but the expansive views over Petra are worth the extra work. Hike down through Wadi Farasa to see additional tombs, such as the Garden Tomb and the Soldier’s Tomb. Discover Jerash, the Dead Sea, Petra and Wadi Rum on this 6-night tour of Jordan from Amman. Explore Amman with your guide and admire the city’s impressive Roman theater. Explore ancient ruins in Jerash, float in the Dead Sea’s salty waters and gaze over the rugged Moab Desert. Visit St George’s Church in Madaba and learn of the city’s biblical sites. Take in panoramic views over the Jordan Valley from Mount Nebo. Enjoy a full day’s sightseeing in UNESCO–listed Petra and explore Wadi Rum in style by 4x4 jeep. Explore thousands of years of mystical history around Petra and the Dead Sea on this 4-night private tour from Amman, with hotel accommodation and transport included. Discover UNESCO–listed architecture and biblical heritage in Amman, Jerash and Madaba. Ascend Mount Nebo for panoramic views over Judah and Jericho. Visit the Christian pilgrimage site of Bethany and swim in the Dead Sea’s salty waters. Enjoy a full day’s sightseeing in Petra, one of the Seven Wonders of the World, and admire top attractions including the Nabataean Theater and Petra Church.